In this book, Dr Ted Bailey uses his research to offer an analogical approach, which can guide and inspire teachers and trainers, both new and experienced, in their daily practice. Using analogies to explain things is implicitly part and parcel of our everyday communication so it makes sense to apply them when introducing new or complex ideas or skills. Drawing an analogy from the daily experience… of students acts as a shortcut between what is familar to them and the unknown target, a key that can unlock any barriers to learning and often triggers later recall. The discussion is in two parts: practical and theoretical. The former includes a selection of analogies organised alphabetically for convenience, used by practitioners in varied learning contexts and from other sources and evaluates them. The underlying theory part is expressed in plain language and presents several inductive and deductive analogical models successfully applied and acting as solutions for further application. 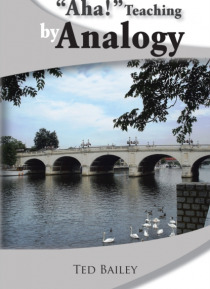 The author appeals to all educators, particularly those in high schools, colleges, or universities, to develop a repertoire of apposite analogies to help bridge learning difficulties and apply them whenever and wherever possible to the benefit of their students.